Be they bangles, bands, or cuffs, we love a good bracelet. A simple bracelet can dress up a casual look. They also work wonderfully to draw attention to your hands to show off a stunning statement ring or fierce manicure. Styling jewelry is all about guiding the eye to the bits you want folks to notice the most. Have a new clutch you are dying to show off? Choose a jangly set of wire bangles. They will draw the eye of your clutch clutching hand and folks will take notice of your new handbag. Pops of complementary color can be added with bright cuffs or chunky plastic bangles. We are complete suckers for an orange bracelet with a predominantly green outfit. Blue offsets a pink ensemble perfectly. On the other hand (see what we did there…) a dainty little bracelet can subtly direct the viewer to your belt or rings. A lovely set of knuckle rings really begs to be matched with a dainty, subdued bracelet. We also love wearing a tiny charm bracelet opposite a bolder watch, or even on the same hand. One of our favorite types of bracelet is the charm bracelet. Once reserved for little girls, the charm bracelet has come into its own. The recent revival of the dangles and beads on ropes and chains around the wrist can be almost primarily attributed to fine jewelry designers and purveyors, Pandora. Their beads on a rope concept and a full line of beads to celebrate practically every occasion put charm bracelets back on the map. 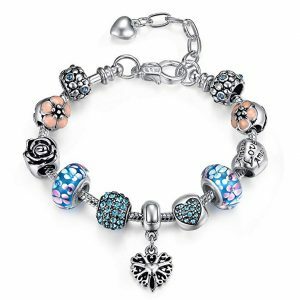 This variety of bracelet falls into three categories; dangle charms, beaded charms, and fixed charms. One charm bracelet can feature all three or a hybrid bead charm with a dangle. These bracelets are so life-giving to us. The gentle motion of the charms sliding around a rope and all the swaying and twisting of the dangle charms is probably our favorite feature of this bracelet. We have amassed a list of our top ten picks for charm bracelets. We attempted to find an example of all three types of bracelets so there is a little something for every taste level. We will start with our favorite example of the classic sort of charm bracelet. A link chain coated in dangly charms of a wide variety is pretty much what pops into most people’s head when you say the word charm bracelets. Thus we present this find by Alexy. Just over seven inches with an optional two-inch extender, this bracelet is ideal for girls or women. The silver-toned selected for this piece is quite bright, leaning toward the whiter side of silver. It features ten charms: two different styles of key, a filigree disc, a jeweled moon, a four leaf clover, a unicorn, a wishbone, a heart, a star, and a “Love”. As far as lucky charms go, you pretty much have your bases covered. 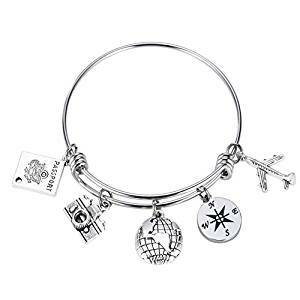 Whether you are needing a little luck in school or professional arenas, looking to be lucky in love or just hoping for a little more luck in general, there is a symbol on this lucky charm bracelet that out to do the trick. Our favorite charm, not often represented in jewelry, is the wishbone. The wishbone is the U-shaped bone from a whole piece of poultry. Typically we find the best wishbone for wishing from turkeys. They are large enough to use for the game and dainty enough to break. The idea is that two people who have just partaken of the turkey-centric meal, each hold one end of the wishbone and pull back toward them while they make a wish. Naturally, the dainty bone will snap. Whoever holds the largest piece once the wishbone breaks will have their wish come true. An alternate version to this tale is that the oldest and youngest folks at the table each take one end of a wishbone on New Year’s Eve. If the youngest person ends up with the largest piece, the year is promised to be full of change and progress. When the largest piece ends up in the hands of the oldest, it is said the year will be a year of reflection and learning. Either way, we love that this charm bracelet includes one of our favorite good luck symbols. 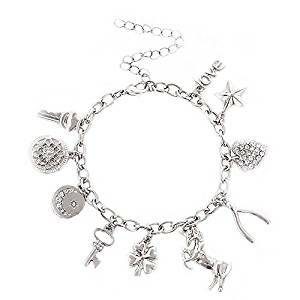 An example of a fixed charm bracelet, this one is so endearing. 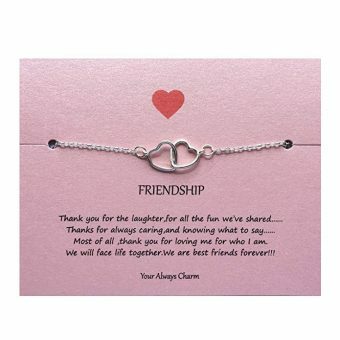 Made by purveyor Your Always, this friendship bracelet features two interlocking hearts in silver. It is dainty and meaningful and that is a wonderful combination. The bracelet is seven inches with an optional two-inch extender. Thus it is designed to fit every wrist with ease. Although it is a finer piece size-wise, we still feel this one is pretty sturdy construction. The two hearts are fixed to the chain with jump rings so there may be a pull point should it get snagged. Just something to be aware of as snagging is a common problem with many bracelets. Luckily this piece does not offer a lot of angles to create the issue, but that does not mean it cannot happen. 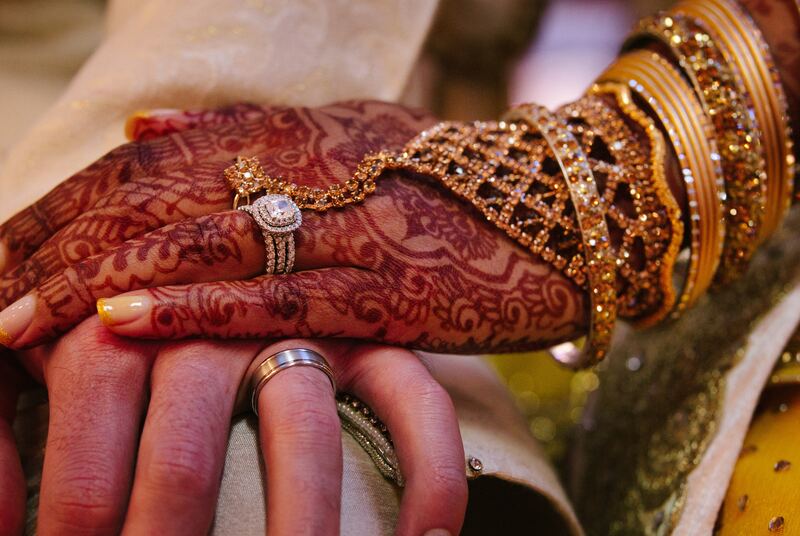 Interlocking hearts traditionally represent unity and togetherness. It reminds us of the infinity symbol, the way the hearts are eternally connected. They will be forever connected, no matter how they are twisted or turned. This is a wonderful piece for best friends or a couple in a romantic relationship. It is also a candidate for a mother and child duo. But where we really think this will have the greatest impact is shared by two sisters or brothers. Siblings have an intrinsic relationship. Raised together, their hearts are truly entwined even if they live halfway across the globe from one another. The sibling bond is very special. It deserves to be celebrated with a special necklace. Purchase one for each sibling to have a matched set. The next piece on our list is a beaded charm bracelet featuring a beaded dangle hybrid right at center stage This colorful bracelet is features a 925 Sterling Silver rope chain coated in a colorful array of beads. It is a multi-media piece that features glass beads, enamel work, rhinestone studded spheres and sterling silver charms beads. The center bead also features a dangling filigree work heart. Peaches, teals, blues, silvers and white shine brightly from this chunky piece. The beads will float freely across the cable rope so it will add a bit of movement as well as the gentle click iconic of charm bracelets. We find that such a comforting sound. The glass beads are styled after millefiori beads. In traditional millefiori beads, layers and strands of colored glass are carefully melted together to create flower shapes. While these are not examples of millefiori beads, they very much remind us of them. We also love the use of the brilliant turquoise and blue rhinestones in this bracelet. We are suckers for a sparkly rhinestone and the makers of the bracelet used them perfectly. Used lightly on some of the beads, one bead features a heart made of the rhinestones. A second bead is positively dripping with them. Altogether the varying beads work so well together. They create a very cohesive piece. This might just be our favorite piece on this list! This next one is not only adorable but meaningful as well. This is the best combination for charm bracelet in our opinion. 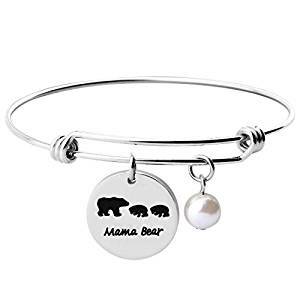 A disc charm featuring a mama bear with her cubs trailing behind hangs off a wire bangle. A single pearl charm accompanies this. You can select from one, two, or three cubs, representative of your own cubs at home. The bracelet is constructed in a wire wrap style. It is both adjustable and stylish. Made of 925 Sterling Silver it is hypoallergenic as well. A mother bear is a wonderful representation of a mother’s love. Mother bears carry a notorious reputation for being incredibly protective of her cubs. According to the stories, every hunter and outdoor enthusiast should know that the worst place to be is in between a mother bear and her cubs. It is a recipe for sure disaster. The Leonardo DiCaprio Oscar-winning movie The Revenant made no bones about demonstrating this in a frighteningly realistic bear attack scene. As a result, the mama bear has become a symbol of a mother’s fierce, protective love of her children. While most bear experts agree that a bear is no more likely to attack in defense of her cubs than she would without any young in the equation, the idea has stuck. Never mess with a momma bear. 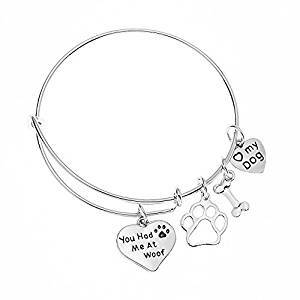 Our second pick of a wire bangle charm bracelet, this one is for the dog lovers. A wire wrap, adjustable design in silver-toned metal, this bangle has four dog-themed charms. It starts with a disc with the words “You had me at woof.” Next up we have a paw print and a bone. Finally, the collection is rounded out with a disc pendant with “Love my dog” featuring a heart icon in place of the word Love. We love this bracelet to stack up with other charmed wire bangles. Keep it monotone to achieve that old fashioned charm and link charm bracelet feel. Combine gold colors for a trendier look. This would also look great paired with a few wraps of wood or stone bead for a very nature and industry pairing. This piece is pretty slender so we are not sure you can have too many bangles going. This is a wonderful piece for daily wear as well. Wear it with a matching puppy-appreciation dainty necklace so the love is spread a little bit of everywhere. If you are not purchasing this bracelet for yourself, this is pawsitively perfect for anyone who spoils their furbaby more than they spoil themselves. (More puns. We have so many.) Naturally, they would never buy it for themselves because why buy jewelry when they can buy more puppy treats? But you can certainly gift it to them and they are sure to love it. No list of charm bracelets can be complete without at least one Alex and Ani bracelet. We have chosen to include this Charity by Design piece featuring a baby block pendant as well as the three classic pendants included on Alex and Ani creations. Because this piece is a charity by design piece, it also includes that charm. Created in a proprietary blend of silver exclusive the Alex and Ani, this piece is resilient and tarnish resistant. 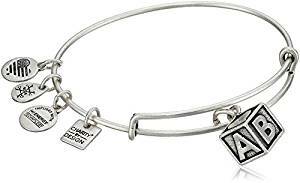 The Charity by Design program by Alex and Ani takes twenty percent of proceeds from the sale of their specially designed pieces and donates it to a specified charity. The proceeds from this bracelet go to the March of Dimes. Originally founded by President Franklin Delano Roosevelt in 1938, the original mission of the organization was to combat polio. Once Jonas Salk’s vaccine very nearly eradicated the once-deadly disease, the March of Dimes shifted their focus from polio to work to improve the health and safety of expecting mothers and newborns. The baby block designed specifically for the March of Dimes cause by the Rhode Island-based company represents innocence and growth. This bracelet is a perfect gift for an expectant or new mother. 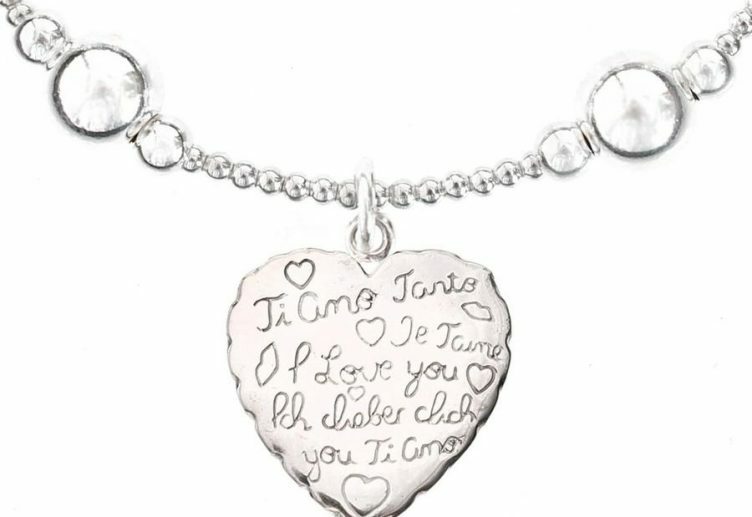 Not only will it be a wonderful charm for her to wear, but it also benefits research and funding that help pregnant mothers and newborns stay safe and healthy all over the world. This inspiring charm bracelet from Luvalti is simple enough in design. A snake link bracelet in silver tone, it features a mere three charms. We really believe this is all it needs. Two of the charms are bead charms, inscribed with the word love. The third is a jump ring hung disc pendant. This bears the words “She believed she could, so she did.” This line is from a novel by R.S. Grey from her novel Scoring Wilder. It has become a popular and powerful mantra for a generation of empowered women. It is reminiscent of the “Nevertheless, she persisted,” movement. In the face of harsh criticism, Elizabeth Warren of the United States Senate continued with a filibuster attempt. When criticized by one of her fellow senators, he used the phrase, “Nevertheless, she persisted.” It was intended to put down her continued efforts to ignore attempts to shut her down. It became the mantra of a nation determined to withstand any and all opposition to rightness and freedoms for women. 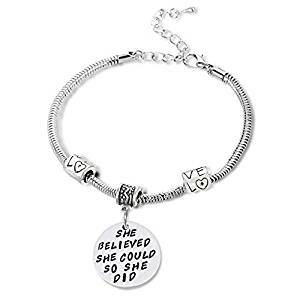 It might be said of Senator Warren that, “She believed she could, so she did.” This bracelet is a wonderful gift for any woman in your life. 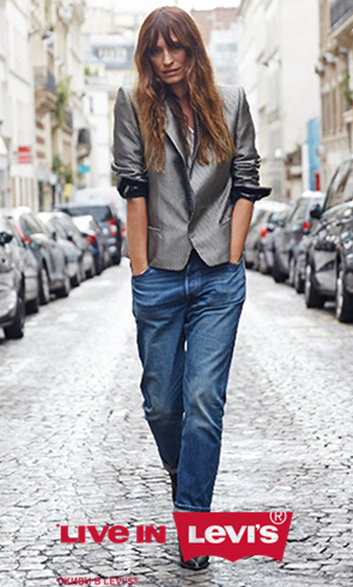 Not only is it stylish but it encapsulates the inimitable femininist spirit. The final bangle style charm bracelet on our list, this one goes out to all the globetrotters and adventurers. Made of stainless steel, this bracelet is ideal for folks who intend to be traveling. The metal is sturdy and well suited to daily wear in exotic and difficult locations. The bangle band with a wire wrap aesthetic features five charms. A plane, a camera, a passport, a globe and a compass all are tied into world travel. We love each of the detailed and shining charms. Charm bracelets are the perfect media for sporting a collection of things you love. When paired with other charm bangles, you can have an arm full of charms. Each bead or dangle representing a passion. Be they hobbies or people, that is the true beauty of charm bracelets. They get to mean something or they can just be for beauty. Really, that is true for all jewelry but we feel charm bracelets allow for further self-expression, more so than necklaces or earrings. This is the perfect gift for graduation or as you are dropping your adventurous loved one off at the airport, yet again. 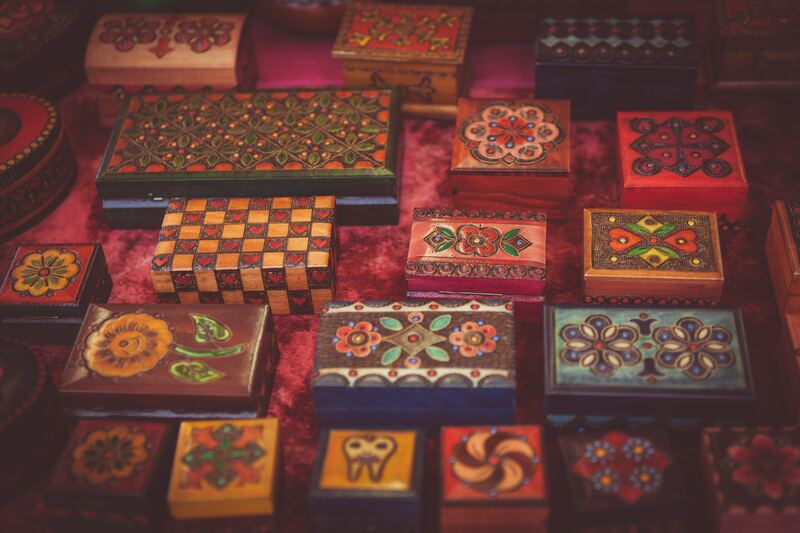 Not only would they have something that represents their wandering spirit, but it gives them a cherished item that reminds them of someone they want to come home to. 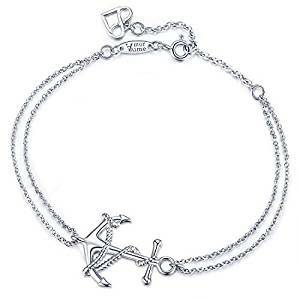 A perfect use of the static charm configuration, this double chained bracelet holds in place a detailed silver anchor. This bracelet is made of 925 Sterling Silver and measures seven inches with an optional two-inch extender. Secured by a c-clasp, this piece is sure to stay secure. An anchor is a heavy weight that while it might seem a burden from time to time, it is strong enough to keep a ship in place in heavy currents and crashing waves. A universal symbol of strength, this piece is one we believe works great for men or women, no matter their preferred styling. We do recommend this piece as part of a layered look. Paired with a wrap of blue-toned japa mala beads or a series of polished prayer beads, we think it would look wonderful. We also really love it paired with a simple cloth wrap bracelet or canvas strap. The anchor being a nautical tool we feel that this styling would be a wonderful nod to its maritime history. Gift this piece to the strong, rooted person in your life. It might be a parent or grandparent. It might also be an important teacher or mentor in your life. You can also offer it to a person who may find themselves needing to be strong. This is a fantastic gift for a young man or woman entering a difficult time in their lives. Our last pick is both a static charm and a dainty bracelet. It really is a very unassuming piece. 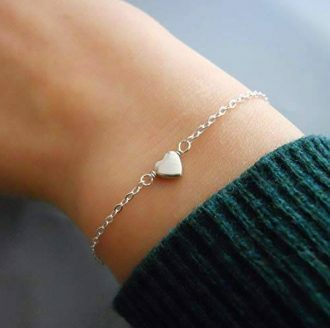 A simple, polished finish silver heart attached to a dainty chain of the same color. 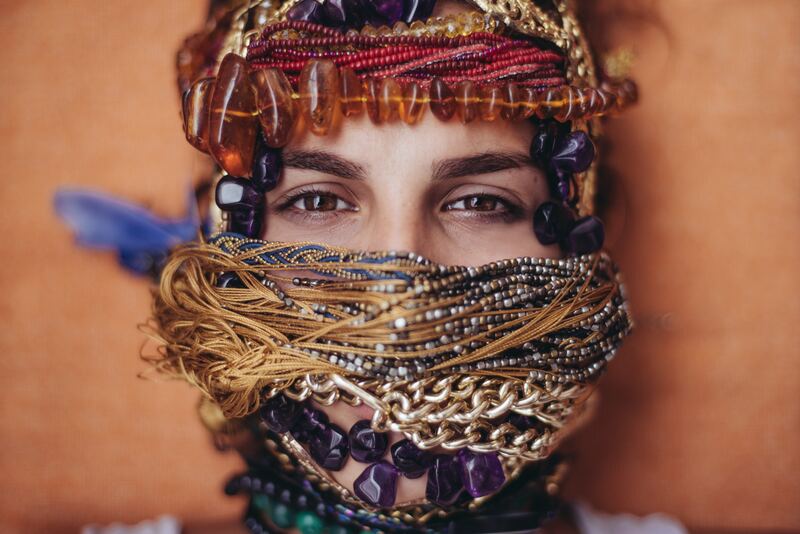 This piece is handmade in Israel by artist Annika Bella. This is a perfect gift for literally anyone and everyone you love. We adore this as a quick and easy bridesmaid gift especially. It is so simply designed it will look perfect with any bridesmaids ensemble and it remains a touching thank you for their support and love during your wedding. Or just buy it for yourself. Wear it on the same wrist as your watch for the tiniest little touch of elegance to your otherwise utilitarian look. This piece is so incredibly simple and that makes it all the more beautiful. There is no reason all the prettiest pieces have to be given away. Back before Miley Cyrus style took a beeline to straight-up statement pieces every place she could think to put them, she rocked a 2006 red carpet with a charm bracelet featuring nothing but hearts. We love all the love on that wrist. Kim Sears, the wife of tennis player Andy Murray, rocked a beaded charm bracelet at Wimbledon while her husband battled on the tennis court. Of course, they are paired with none other than a tennis bracelet. That is a clear and obvious choice for the event. 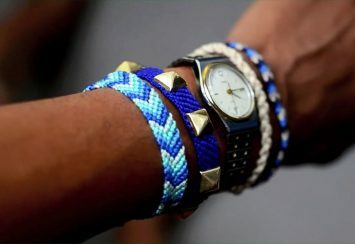 And do not forget that men can absolutely rock the charm bracelets. Justin Timberlake and David Beckham regularly rock beaded and charmed bracelets. Of course, theirs are styled a little differently and typically role out a little less blingy than traditionally styled feminine looks. But men can absolutely rock the charmed life. Charm bracelets, admittedly, can be a bit of a pain to properly clean. Typically they feature a lot of detail etchings, carvings, and shapes. That makes them super attractive for style purposes but not as much when it comes to daily care and cleaning. 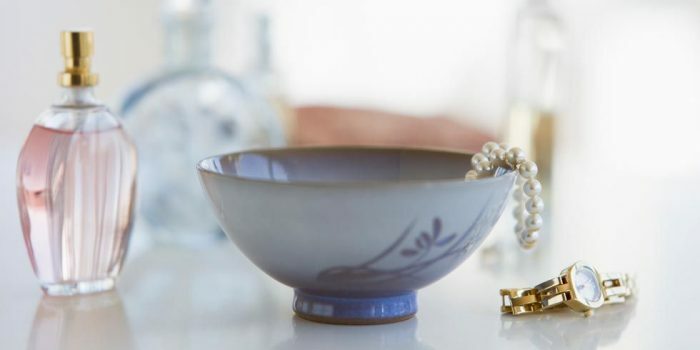 As we all know, a wipe down after every wear with a clean, dry microfiber cloth preserves both the shine and life of your jewelry. But bracelets, in general, really get the brunt of the grime. 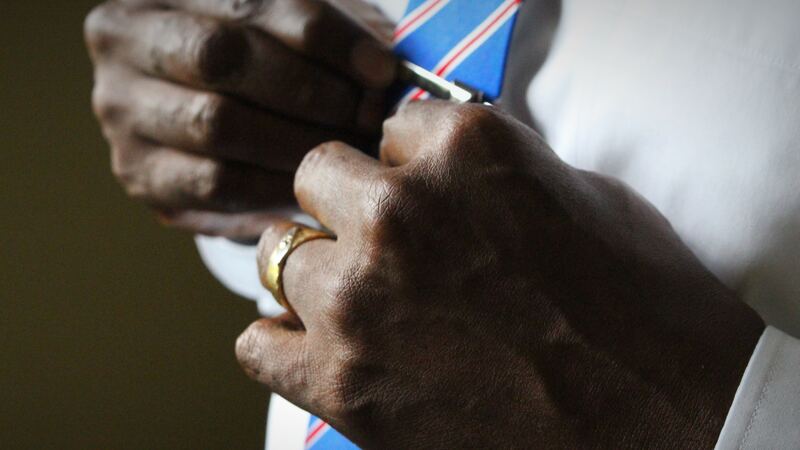 Being so close to our hands, our bracelets are far more exposed to picking up grit throughout the day. We recommend not just a wipe down but a quick dip in warm water with a mild soap. Dry your bracelet off well, especially if it is sterling silver or gold. These are prone to tarnish if left damp. Preventing scratches and damage to your bracelets is tricky as well. For those of us who spent quite a bit of time at the keyboard, it can be a challenge to prevent the regular sliding around on our typing surface from scratching and scuffing up our bracelets. A regular care routine can help prevent this but not entirely. That comes straight down to being gentle and styling carefully. Charm bracelets are also prone to snagging and catching on your clothing. When choosing a bracelet to wear, be cautious when pairing charms or dangles with loose knit clothing like sweaters. Snagging can not only damage your favorite sweater, but it can also loosen fittings and jump rings by with the charms are attached. It may also try to pop loose crystals or gems on more economically priced pieces. 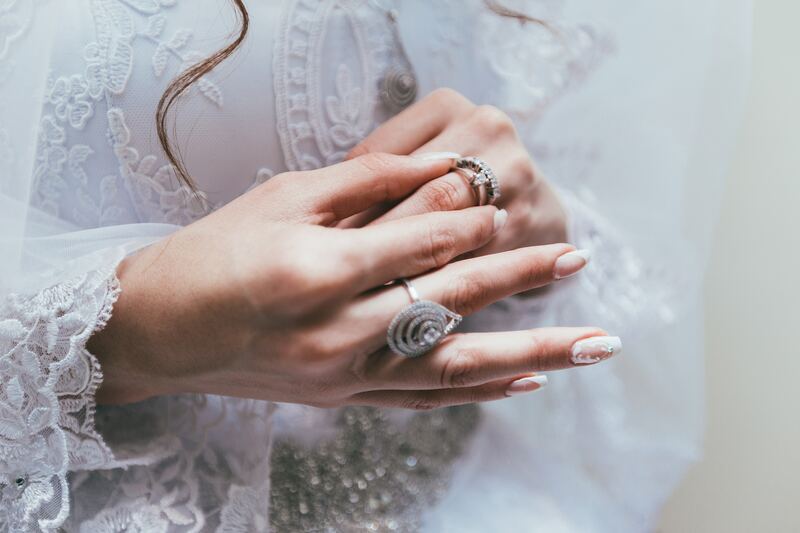 Routinely check your charms and gems to be sure their fittings are properly closed, any prongs are still pressed down around the crystals, and gems are not wiggly in their settings. If a gem is a little loose in the setting, we recommend taking it to an expert for repair as soon as you discover it. There is nothing more heartbreaking than picking up your favorite piece and realizing a stone has gone missing.